CEDAR CITY — Down by four points at halftime, the Snow Canyon Lady Warriors used a 19-4 run during the third quarter to push past Canyon View and roll to an eventual 48-30 victory. The first half was a low-scoring affair, with Canyon View taking an 18-14 halftime lead. “At halftime, we looked at the scorebook and saw that we had only given up three field goals,” said Snow Canyon head coach Ryan Rarick. “All of the rest of their points were on free throws. Snow Canyon starting guards Hallie Remund and Tylei Jensen provided the one-two punch that the Lady Warriors needed during the third period. Remund scored 10 of her game-high 16 points during the third quarter, including a couple of 3-pointers, while Jensen scored nine of her 14 total points during that same span. “We needed to shoot with confidence, attack the basket, and get ourselves to the free throw line,” Rarick said. Allie Parr added six points for Snow Canyon during the game, but it was her defensive play that drew praise from her coach. “Allie rebounded and defended like crazy for us tonight,” Rarick said. 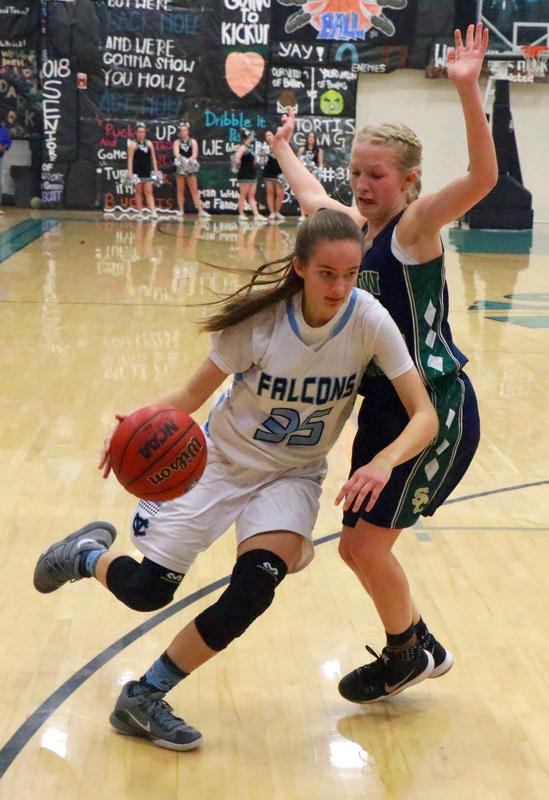 The Lady Falcons, meanwhile, managed just one field goal during the third quarter, an inside shot by Bryn Banks that made it 21-20 in favor of Snow Canyon with just under five minutes remaining. 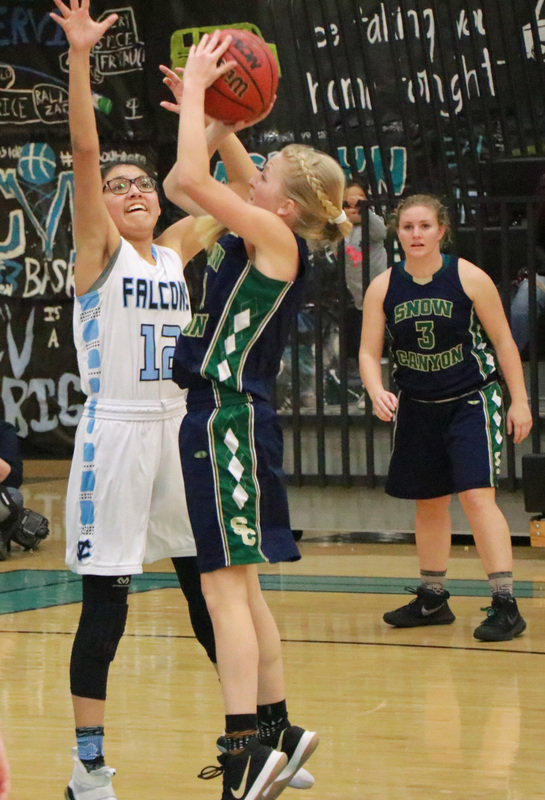 Canyon View’s only other points during the period were on a pair of free throws by Ashlyn Banks with 2:31 left in the third, which again brought the Falcons within a single point, 23-22. Snow Canyon then went on a 10-0 run to close out the third, taking a 33-22 lead heading into the final quarter. Canyon View continued to struggle offensively during the fourth, scoring just one field goal – a 3-pointer by Jordan Nielson – while going 5 of 10 from the free throw line. Ashlyn Banks led the Lady Falcons in scoring with eight points, all of which came at the free throw line. Nielson contributed seven points, adding to her trey by going 4 for 4 from the free throw line. Canyon View converted 19 of 31 free throws as a team, while Snow Canyon made 17 of 27. Snow Canyon improved its Region 9 record to 5-5 with the win, its first road victory of the season. The Lady Warriors are now a half-game behind 5-4 Desert Hills for the fourth and final playoff spot. Canyon View dropped to 2-7 in region with the loss to Snow Canyon. Snow Canyon next plays at Dixie Thursday. Canyon View has a bye Thursday and will next host Pine View on Tuesday, Feb. 13. In other Region 9 action Tuesay night, Hurricane avenged its earlier season loss to Dixie by overpowering the Lady Flyers, 70-38. The Lady Tigers, who lost at Dixie 29-28 on Jan. 11, had no problems scoring this time around, jumping out to a 33-15 halftime lead and staying comfortably ahead the rest of the game. The Lady Tigers outrebounded the Flyers 37-18 and made 15 steals to Dixie’s five. Madi Hirschi led all scorers with 19 points for Hurricane, while teammate Jayden Langford added 18 points and grabbed a team-high eight rebounds. “Madi and Jayden both played awesome,” Homer said. Dixie was led by Sina Tapasa, who scored 13 points and had five rebounds. Sina Schwalger added seven points for the Lady Flyers. With its sixth straight victory, Hurricane has now moved into second place in the Region 9 standings, its 6-3 record being a half-game ahead of Pine View, which lost to Desert Hills Tuesday night, 43-21. Hurricane next plays at Desert Hills Thursday. Meanwhile, Dixie dropped to 2-7 in region play with the loss. The Flyers will host Snow Canyon for their next contest Thursday.